Aerial Dance Chicago (Chicago, IL) (ADC) was founded in 1999 with a vision of taking dance into flight. 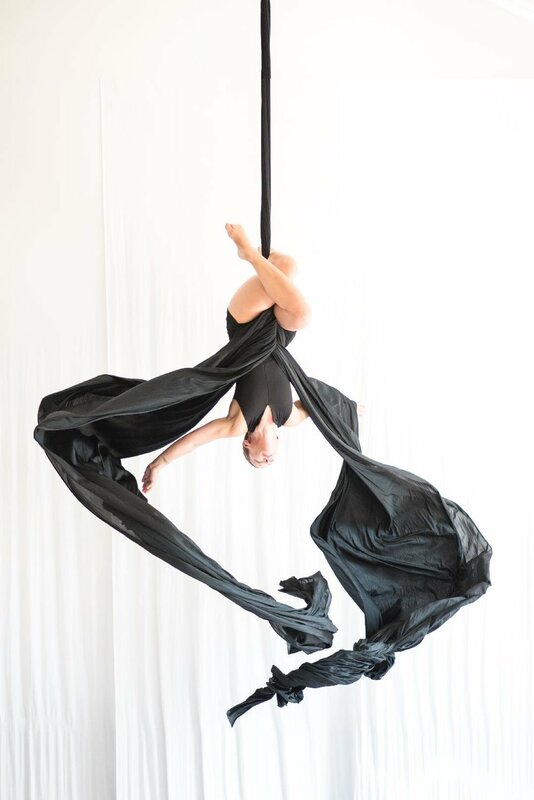 Incorporating a variety of apparatus such as suspended fabrics, bungee cords, hoops, swings and ropes, dancers were no longer bound to the traditional dance floor, and the company set out to explore the potential for compelling and powerful expression within multi-dimensional space. In 2014, ADC opened Chicago’s premiere dance center dedicated to the fine art of aerial dance, offering cutting-edge curriculum in contemporary dance, both on the ground and in the air. Located at 4028 W. Irving Park Rd, with immediate access to 90/94 and the Irving Park Blue line and Metra stop, this new center is situated at a cultural and transit hub in Chicago, and is an asset to the professional performing arts community in Chicago. James Morrow (Norfolk, VA) A native of Chicago, IL, James Morrow is the founder and artistic director of james morrow/ The Movement. Coming from an urban background, Morrow yearns to see the contemporary composition prevalent in concert dance integrated into the hip-hop culture with which he is submerged. His movement has become a fusion of modern, contemporary, and urban dance styles. His choreography can be seen on companies throughout the U.S. and internationally working in Utrecht, Vienna, Mumbai, Puebla, Toronto, Montreal, Krasnoyarsk, Kerch, and New Brighton. Morrow was on Faculty at the American Dance Festival (summer 2010) and at the Bates Dance Festival's Youth Arts Program (2018). He received a fellowship to Hollins University/The American Dance Festival (2011) where he earned his MFA in dance. He has been recipient of the Artist Ambassador Award to Northeastern Illinois University (2001), The Mordine and Co. Mentoring Project (2006), Chicago Cultural Dance Center’s Dance Bridge (2008), Movement Research at Judson Church (2012), SOLO Commissioned Choreographer for Minnesota's McKnight Dance Fellow (Stephen Schroeder 2012), Bates Teacher Fellowship (2013), the Massachusetts Cultural Council Fellow in Choreography (2014), The Helen Coburn Meier & Tim Meier Foundation Achievement Award (2015), Boston Center for the Arts Choreographic Residency (2016), and The Boston Dance Alliance Retreat and Rehearsal Fellowship (2017). As a dancer/ performer, Morrow has worked with Chicago based companies: The Joel Hall Dancers, Deeply Rooted Productions, Ascension/The Kirby Reed Project, Ken Von Heidecke’s Festival Ballet, Larry Long’s Civic Ballet, Culture Shock Chicago, Concert Dance, Inc., Mordine and Co., Hedwig Dances, The Tyego Dance Project, Impetus Dance Chicago, MOMENTA, and Nick Cave's (Soundsuits) of The Art Institute of Chicago. Other performance credits include working with New York’s: Helen Pickett, nicholasleichterdance, Gina Kohler/ Dream Factories, Danielle Russo Dance Company, Tami Stronach Dance, Tessa Chandler, Margaret Morrison, Wendell Cooper, Yozmit, DeeLite, DJ Kotchy, Bahama’s: The Baha Men, Minnesota’s: Sesame Street Live, Toronto’s: Gerry Trentham/ Pounds Per Square Inch Theatre, Michigan’s: Kalamazoo Ballet, Berlin's : Tino Sehgal, North Carolina’s: Tommy DeFrantz/ Slippage, Ellen Hemphill/ Archipelago Theater, Jim Havercamp, Alex Maness, Florida’s: Jacksonville Dance Theater, Rachael McClellan Leonard, Jacksonville Symphony Orchestra, Elevated Aerial Dance, and Massachusetts's: Jen Pollins, Paul Matteson, Peter Dimuro, Caitlin Corbett, Meghan McLyman, Across The Ages Dance Project..
As an educator, Morrow has worked as full- time dance faculty/ Assistant Professor of Dance at Northeastern Illinois University, Florida State College at Jacksonville, Episcopal School of Jacksonville, Hartford Academy for the Arts, Pioneer Valley Performing Arts, and Salem State University. He is currently living in Norfolk,VA. and working as an assistant professor of dance at Old Dominion University. Kate Corby & Dancers (Madison, WI) “Compelling” and “full of gestured conflict and impish daring” (Chicago Tribune), Kate Corby & Dancers’ collaborative work has been seen in the Midwest, New York, California, Seattle, Atlanta and internationally in Canada, Mexico, Brazil, Taiwan and Hungary, where artistic director Kate Corby traveled as a Fulbright fellow. Corby, featured in Dance Magazine as one of six choreographers “on the cusp of making waves in the larger dance world,” is currently an associate professor of dance at the University of Wisconsin-Madison, where she has taught for nine years, and began serving as the Dance Department chair in 2017. She established Kate Corby & Dancers in the Midwest with Chicago-based dancers Erin Kilmurray, Emily Miller and Anna Normann in 2009. Some of the company’s past projects include: the Chicago Cultural Center’s SpinOff Festival, the World Dance Alliance-Americas Festivals in Vancouver, BC and Puebla, Mexico, a collaboration and live performance with cellist Zoë Keating, commissioned by the Wisconsin Union Theater, the Live Art, Live Rio! Festival in Rio de Janeiro, Brazil, The A.W.A.R.D. Show! 2010: Chicago at the Dance Center of Columbia College and the World Dance Alliance Global Dance Event at Dance Theater Workshop in New York (now New York Live Arts). Recently Corby began creating dance films, and her short film Hungars Beach was screened in the Wisconsin Film Festival, Triskelion Arts’ Dance Film Festival, the Detroit Dance City Festival Dance Film Fest, Flatlands Dance Film Festival and in the Midwest RAD Festival. She was an artist in residence at Experimental Film Virginia in 2015 and a collaborating choreographer for video artist Orit Ben-Shitrit’s DANCE MOViES commissioned film by EMPAC at Rensselaer Polytechnic Institute, Ward of the Feral Horses. Michel Rodriguez Cintra (Chicago, IL) is a native of Havana, Cuba where he danced for Danza Contemporanea de Cuba as a principal dancer. In 2008, Rodriguez moved to Chicago where he joined Hedwig Dances and Concert Dances Inc., and appeared as a guest artist with The Ruth Page Civic Ballet. Since living in Chicago, Michel has also danced for Khecari, The Cambrians, and Lucky Plush Productions, among others. Rodriguez is currently a dancer, choreographer, and teacher in the Chicagoland area. Taylor Mitchell (Chicago, IL) graduated from The University of Arizona. He has performed with Thodos Dance Chicago, Cerqua Rivera Dance Theatre, Cocodaco Dance Project, and other projects. He has choreographed for DanceWorks Chicago, Thodos Dance Chicago, Dance In The Parks, Level Dance, Cerqua Rivera Dance Theatre, and others. In summer 2017, he launched his international duet project premiering new work at the 2017 Summer Kieler-Woche Festival (Germany) and has taught jazz dance to students abroad. Taylor is currently in the process of further developing his marriage between dance and clowning techniques as a solo performance artist and choreographer. RE|dance group (Chicago, IL) Michael Estanich and Lucy Riner established RE|dance group in 2009, after ten years of performing, producing and collaborating on various dance projects in Chicago together. As former members of Molly Shanahan/Mad Shak, we cultivated our choreographic ideas and many years later, decided to form RE|dance group as a means to further develop our inimitable, creative dance-theatre approach. Central to the success of the company has been the trust and collaborative spirit between us—as we each spearhead different aspects of the company’s organization. Michael evokes and directs much of the artistic voice of our work, while I manage the day-to-day, business, and strategic planning components (and have the pleasure of performing and informing the work we do). Originally designed as a duet partnership for us to take advantage of and further develop our long established and admired performance energy together, RE|dance group quickly grew into a company of nine dancers committed to creating enthralling, complex, and personal dance-theatre. The company annually produces a Chicago season while our national touring schedule continues to add new cities each year. RE|dance group is working towards the production of our of 10th anniversary season which will include several performances in spaces large and small throughout 2019. As 2018 unfolds, RE|dance group is excited to continue casting our net out to audiences in different parts of the country and world. South Chicago Dance Theatre (Chicago, IL) (SCDT) is a multicultural organization aiming to preserve the art of dance through quality performances and educational opportunities. The diverse repertoire of the company seamlessly fuses classical and contemporary dance styles, and preserves historic dance work. With international diplomacy serving as a guiding principle of the organization; the 2018-2021 seasons are dedicated to working alongside our partner artists in South Korea. In its inaugural season, the professional company has worked with NY2 Dance/“Night Out in the Parks”, the South Shore Opera Company of Chicago, the Logan Center for the Arts, Kennedy King College, the International Association of Blacks in Dance, the University of Wisconsin-Milwaukee Midwest Interdisciplinary Graduate Conference, “See Chicago Dance” and the University of Chicago's Office of Civic Engagement. VADCO/Valerie Alpert Dance Company (Chicago, IL) is dedicated to fostering awareness and advancement of the arts throughout Illinois communities in the immediacy of contemporary dance as an art form. Founded in 2000, the company affords audiences of all ages various presentations of contemporary dance that challenge the imagination. VADCO is committed to the continued effort of advancing the arts through innovative choreography and collaboration with other artists, including composers, artists, and poets. VADCO has touched thousands of people across the nation with its exciting choreographic programs and will continue to further excellence in dance in the Chicago area, as well as nationally and internationally. The programming activities in the last several years reflect the diverse community that VADCO serves with its mission to provide dance to a variety of communities in the Chicagoland area. While these communities often have the desire for art experiences they are not afforded the opportunities. VADCO is often the first dance organization to serve these communities. And, the diverse programming that VADCO brings to these communities is often tailored to the audiences it serves. Some highlights of the past year performances and workshops include the Captain James A. Lovell Federal Health Care Center (North Chicago), Art in Response to Violence at Northeastern Illinois University, Woodview Elementary school (Grayslake), and Grayslake North High School. 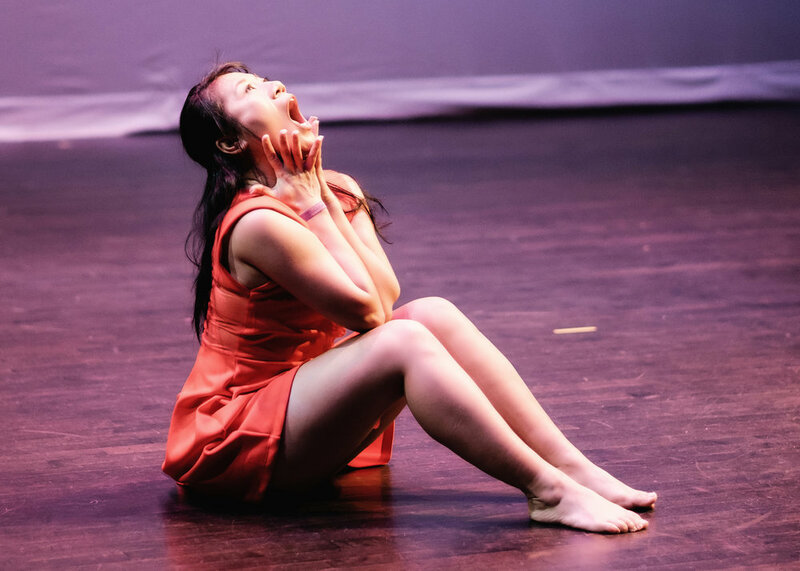 Performances have been additional honored here at home at Block 37 to celebrate Audience Architects Chicago Dance Month and Moving Dialogues with the Chinese American Museum of Chicago. Additional festivals across the U.S. included invitations to perform in Boston Dance Festival, Wave Rising (New York), Detroit City Dance Festival, Midwest Alternative Arts Festival (Kalamazoo, MI), and Bell House Choreography Exchange (Tulsa). Weslie Ching (Santa Barbara, CA) holds a BFA from the University of California, Santa Barbara where she was a Regent’s Scholar and recipient of the Chancellor’s Undergraduate Research Award. Since 2014, her work has been presented in venues such as the Museum of Contemporary Art, Santa Barbara, Pasadena Dance Festival, SoloDuo Festival (New York), and PushFest (San Francisco - upcoming September 2018). She is a recipient of a Santa Barbara Independent 2016 "Indy" award for excellence in choreography and grants from the California Arts Council and the County of Santa Barbara Arts Commission.